Today, customers receive technical support by phone, email, chat and pre-installed remote support clients—often resulting in a cumbersome, time consuming and frustrating experience. With customer satisfaction being a key business driver for IT and Technical Support departments, employing user friendly tools is critical for enhancing service levels, improving resolution times and minimizing costs. In addition, technicians, trusted service providers and employees frequently require full control of unattended mission-specific PCs from remote locations in order to provide routine or emergency support, administration or maintenance. SonicWALL® Virtual Assist is a remote support tool that enables a technician to assume control of a customer’s PC or laptop for the purpose of providing remote technical assistance. With the customer’s permission, the technician can gain instant access to a computer using a Web browser, making it easy to diagnose and fix a problem remotely without the need for a pre-installed “fat” client. 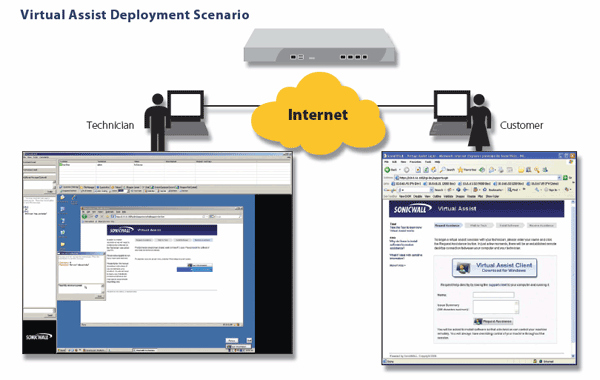 SonicWALL Virtual Access is a remote PC control tool that enables authorised end users to gain secure remote access to their unattended Windows-based computers from anywhere. Users simply need to install the Virtual Access agent onto a Windows PC with Internet access and, as long as that PC has a connection to the SonicWALL SSL VPN, the user can connect to that PC from anywhere they have an Internet connection. This is especially useful for remote employees who have the need to connect back to a home office computer or small branch office PC that is not normally connected to the LAN. Anywhere, anytime remote support (Virtual Assist) improves customer satisfaction and support staff productivity by easing remote system troubleshooting and speeding time-to-resolution on outstanding help desk trouble tickets. Anywhere, anytime remote PC control (Virtual Access) supports flexible teleworking and managed services initiatives, and lowers overhead costs by streamlining distributed application system deployments, operations, upgrades, administration and maintenance. Virtual Assist chat functionality provides an efficient communication alternative to costly phone support. Diagnostic capability enables a technician to quickly obtain system information from a customer’s computer or unattended PC. Personalized Virtual Assist customer Web portal enhances the user experience by providing a familiar look and feel for both Windows® and Mac® customers. Easy-to-use Virtual Assist technician standalone client facilitates the management and scheduling of the support queue. Seamless integration of the SSL VPN appliance behind virtually any firewall enables organizations to leverage their existing network infrastructure. * Additional license required. Only available as a software add-on module for the SSL-VPN 2000, 4000, SRA 1200, SRA 4200, EX-750, EX6000 and EX7000. Technician logs into support Web portal or standalone client to monitor queue or invite a specific customer via e-mail. Customer logs on to portal and requests help or accepts the e-mail invitation. Meanwhile, the thin client is pushed seamlessly through the browser to the Technician and Customer. Technician sees Customer in queue and requests access to computer. Customer gives permission and remote support session begins. The Technician now actively controls the remote computer. The Customer is able to see what the Technician does on the screen. The Technician or Customer may end this session at any point in time. Please read the corresponding product page for a product's maximum number of licenses before buying.